We picked up two Högsten chairs when we were at IKEA over the weekend. They're outdoor chairs but as you can see, we're using them in our living room. 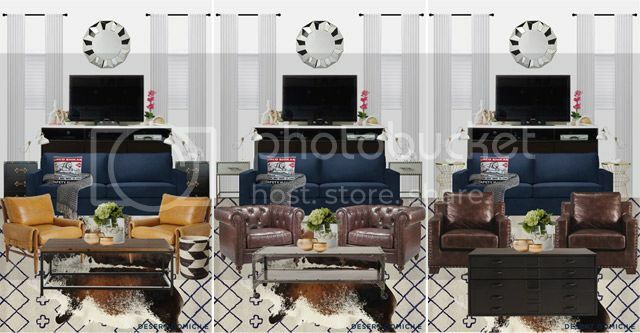 They're much different that the chairs I had originally shown in the mood boards I put together for our future living room but I actually prefer them! 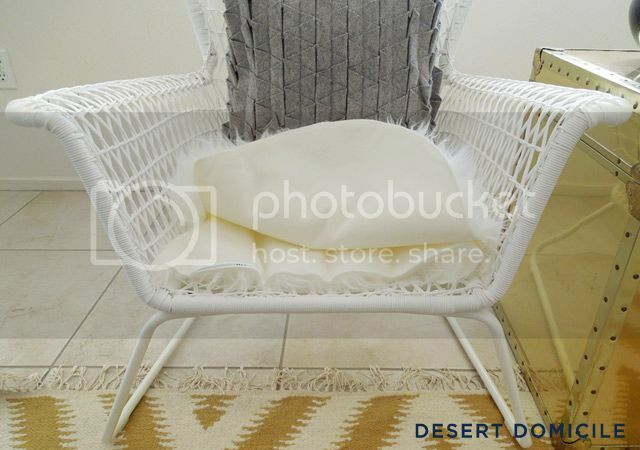 I've been seeing a lot of wicker/rattan chairs used in various interiors lately and I love the look so I decided to replicate it in my own home. 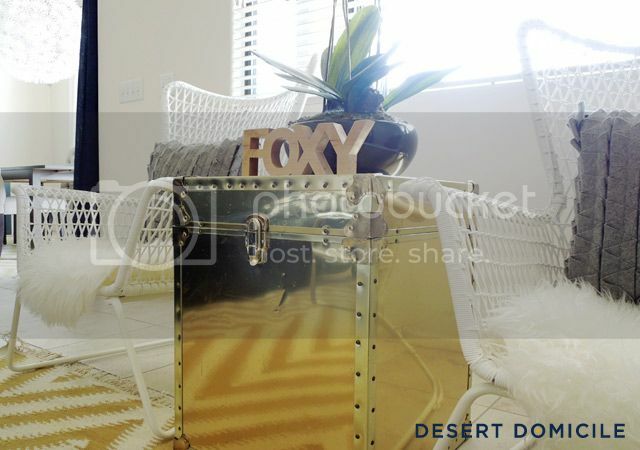 I placed the vintage brass trunk I picked up in Phoenix in between the chairs. I topped it with a faux orchid and a FOXY sign I got for half off during Target's after Valentine's Day sale. I'm still debating on whether or not I should paint the sign or leave it as-is. 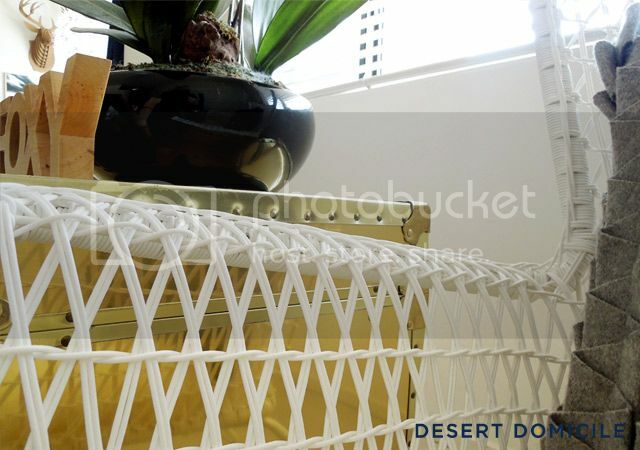 I love the rattan's geometric pattern. 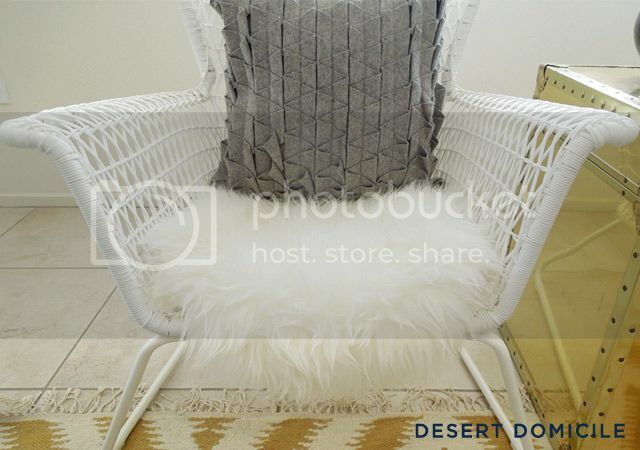 I couldn't find a cushion I liked so I added one of IKEA's faux sheepskins to each seat to add some texture and cushiness. I folded it in half and tucked the curved outer parts underneath. I plan on stuffing a feather pillow insert in between the folded sheepskin to add to the comfort factor. 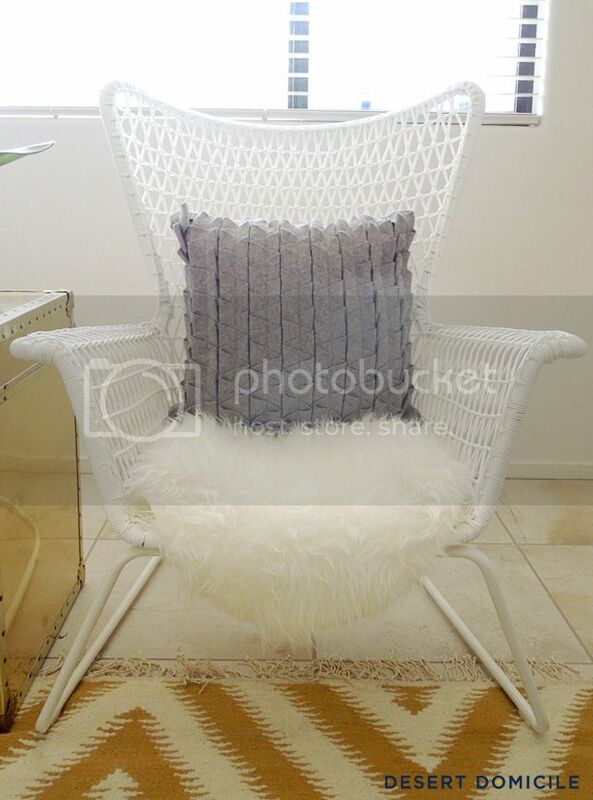 The chairs are surprisingly comfortable with or without the added sheepskin! The next item on our living room's to do list is curtains! We picked up the supplies for our DIY curtain rods last night and will be hanging them up either tonight or tomorrow. I can't wait! What do you think of our new chairs? Looks so so good. I love the chairs with the trunk in the middle. I'm still hunting for a brass one. I just told my father-in-law to be on the lookout. He has a trunk obsession and looks for them all the time. they look so perfect with the trunk you promised to give me. right? They look great with the trunk! Happy weekend! I've been eyeballing these for our patio and was curious how comfy they are. Thank you! Love this! You seriously have the coolest style. Oh wow - what a dramatic change of direction, but I love it! I've always thought those chairs were super stylish! The sheepskin + brass = perfection! Thanks Brynne! I'm super happy I changed my mind. The other chairs were nice but too bulky. If I ever stumble upon another set of chairs that I think would be better, these can always go live on our front patio! leave the foxy as is for now. I like it bare! i love that trunk so much too! I'm planning on leaving it. It looks better in person than it does in the photos (doesn't blend with everything as much)! i actually saw them last week too - i wanted to go back for them! - i LOVE them - awesome purchase!!! You should get them! They're very affordable and if you don't like them inside, you can always use them outside – win, win! Love that you took the risk on outdoor chairs. They look beautiful... too beautiful to be outside! They fit right in! I like them too. Ive thought about it myself. They look great. I love them- so light and airy and fun! 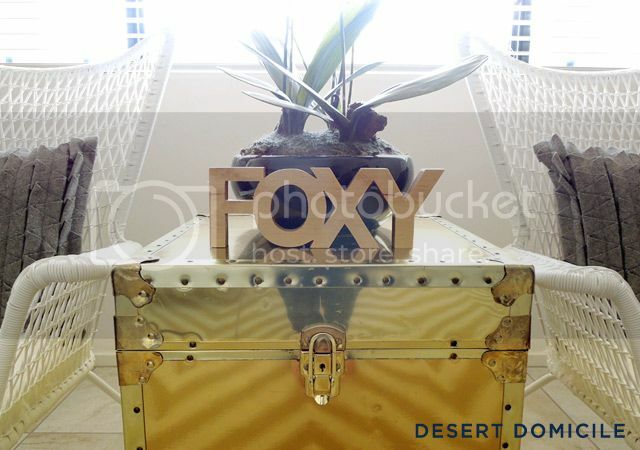 I love that foxy sign too- wish I had seen it. I have something a little similar I'll have to show you a picture of although it needs a makeover! I absolutely love them! 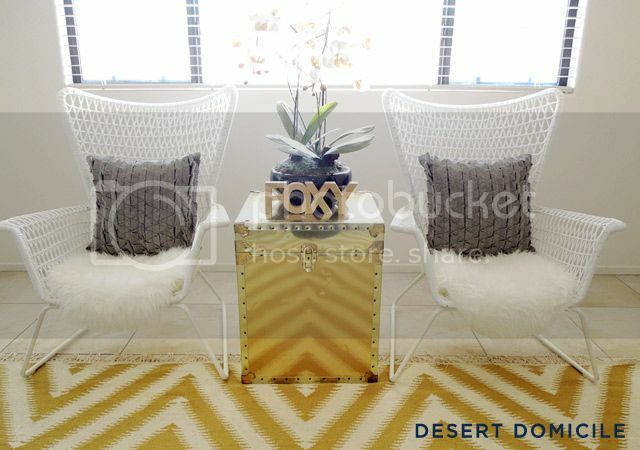 Wicker inside is such a great look! O.M.Gosh! I am so happy I came across this post. I have been looking for something modern and in my price range to replace an armchair of mine. I think this is it! Which Ikea are you near? 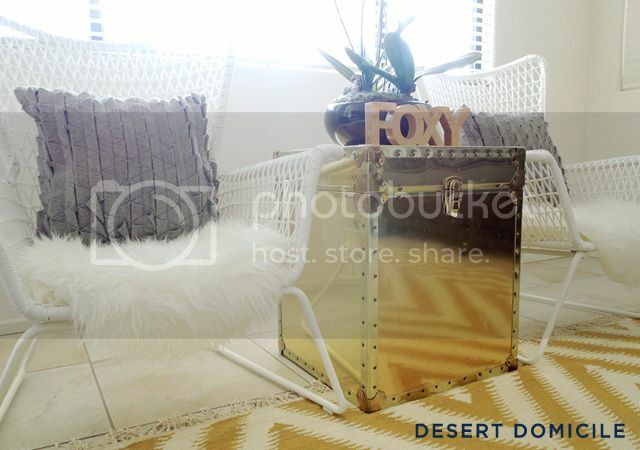 I have been searching high and low for these chairs & was under the impression they were no longer in the U.S. I got my chairs from the IKEA in Tempe, AZ back in March. They've been discontinued though so I'm not sure if they're available anymore. You may be able to find them as a last chance item in store though! Hi. I was wondering which Ikea store you bought the Hogsten chairs at. Right now, they are not selling them at the Colorado Location or on their website...which seems odd. Thanks! I got my chairs from the IKEA in Tempe, AZ back in March. They've been discontinued though so I'm not sure if they're available at all locations anymore.